A Circle of Thanksgiving - Craft, Literacy, and Math for Kids! A Circle of Thanksgiving – Craft, Literacy, and Math for Kids! Materials needed: Yarn or string (enough to make a wrist bracelet for each child) and pony beads (blue, black, red, white, yellow, orange, and purple pony beads -enough for each child to have one of each color). 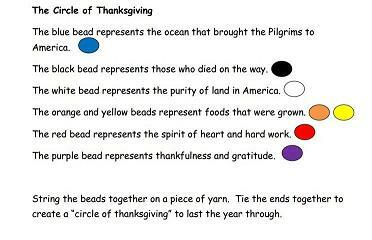 Read the Circle of Thanksgiving (linked above) to the children and have them put on one bead for each line that is read. Discuss words the children may not know: represent, purity, gratitude, etc. Discuss the color choices and why colors are often associated with words, feelings, or objects. Give the children an example by discussing the sun. When we read or listen to words that describe the sun, the colors of yellow and orange often come to mind. 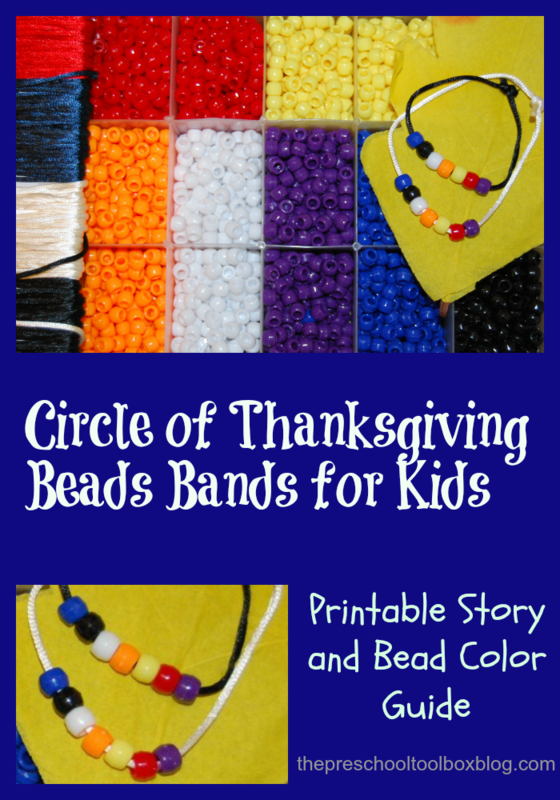 When the children have added all the beads to their string, tie the ends together to create “The Circle of Thanksgiving.” The children may keep at school or home and retell the bracelet’s meaning as they look at the beads. For very young children, repeat the activity over the course of several days. Invite the children to retell the story to their peers or to parents/family at home. Print the file linked above for each of the children. Have the children mark an X with a crayon or pencil over the picture that does not belong with the others in that row. The last page of the file can be used for patterning (have the children cut the pictures from page one to pattern with) or for drawing same/different shapes. Print the turkeys from the template above and laminate for durability. Have the children cut out each of the turkeys or pre-cut for younger students. Have the children use masking tape to tape the turkey to one end of a pipe cleaner (younger children will need assistance.) On the turkeys, have the children write or stamp any numbers that you are learning. Using the pony beads, have the children slide the beads, one-at-a-time, over the end of the pipe cleaner until they have counted all beads needed. The children can pattern different colors of pony beads while counting, if desired (see photo above). 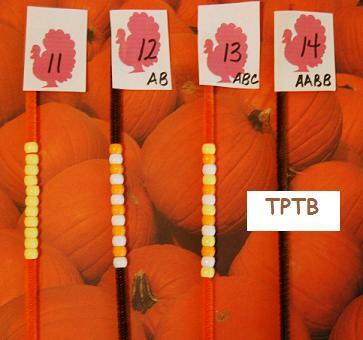 For more Harvest or Thanksgiving Theme Literacy and Math Ideas, see the Thanksgiving Thematic Unit at The Preschool Toolbox. « Thanksgiving Theme Math and Crafts! Thanks for linking up to Learn through Play. I am just loving finding all these great new blogs! I am excited to follow you and get more great ideas for my preschooler. Ann – I love it, too! Thank YOU for visiting! It is fun to “meet” new faces and learn what YOU do! Ashley – thanks so much for visiting! Love “meeting” new bloggers with kids! This is great! I’ll have to try it out with my kids. Thank you for linking to the Learn Through Play hop! These are fun ideas! I pinned it and will share it on my page this week. Theresa – thanks so much for sharing AND your comment!